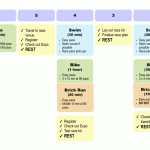 This month I’ve outlined my approach to Ironman racing. From the process of tapering through to the nutrition and pacing strategies I favour. The methods have worked for me and so far this season have worked for my athletes, but as with any broad plan it needs testing and adapting to fit each individual. To bring the topic to a close I’ve produced this summary with the figures I build my race plans around. Read through the previous articles for more on the thought behind this post. As I prepare for a race I spend training time testing out the theory – establishing thresholds, trialling target intensities and the nutritional plan. The aim is to minimise unknowns and be ready to cope with any outcome on race day. Practice is vital. I’ve given brief thoughts on how to test the pacing in training and it’s essential you do. Some sessions need to incorporate extended periods holding race pace and using race nutrition. Learn what works for you, adapt this guide and then apply to your races. It is difficult to pace a mass start, open water triathlon. The pool doesn’t benefit from a wetsuit or a draft and doesn’t present navigation issues. Ultimately feel is the guide to pacing an Ironman swim, but benchmarking that feel in the pool will help you hold it when racing. What matters is the effort level being sustained and ensuring it is not excessive. Considering an athlete with a Critical Swim Speed (CSS) of 1:30 per 100m, they would aim to hold the following effort over a 3.8K swim. During a race assuming they were drafting and sighting well, I would expect them to go faster for that effort. The swim guidelines are more of a training aid, used to develop a feel for Ironman intensity as opposed to controlling effort in a race. The underlying test is Critical Swim Speed (CSS), effectively threshold pace in the water. Establishing this enables focussed training to develop speed and also work at Ironman specific intensities. I regular train 100m or 200m reps at CSS pace with short rest to help develop threshold speed. I use longer sets with consistent pacing to target Ironman pace; I might do a descending set from 600m down, raising pace over the shorter reps. When swimming open water I spend long periods holding at least Ironman intensity. The bike allows easier focus on pacing, particularly with power or heart rate available. Perceived exertion remains an important factor to incorporate, use all the information you have available. The aim is to conserve energy for later in the day, avoid spikes in effort and keep consistent. Concentrate on your own race and not what others are doing around you. Operating a system of caps allows you to push on portions of the course, but in a controlled manner. The aim is to go as fast as you can within the boundaries of those caps. Resist temptation to break them, chances are you’ll pay for it later. 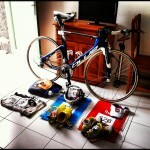 Fuelling is a vital part of an Ironman strategy, it is also individual and requires practicing before race day. Aim to consume as much as you can tolerate at race pace, if you can’t stomach the minimum amounts you may have to slow. Taper nutrition – eat the most in the early hours; if using solid foods favour them at the start and switch to simpler gels as you approach the run. Remember – practice in training, find what works for you. I’ve previously written about testing thresholds; they act as the basis for many workouts. I like to incorporate threshold sessions most of the year, but the key Ironman specific bike workout is the long ride. Once sufficiently fit this routinely incorporates work at or above Ironman pace – structured, controlled periods of effort. It also becomes a good time to practice race nutrition and train your ability to consume more. Practicing both pacing and nutrition over long workouts is essential. Use the sessions to develop a sense of how the effort feels, particularly later in the long ride when fatigue is an issue. Test nutrition and products to ensure you can tolerate them under stress. A good block of these sessions close to race day leaves you confident you know how to perform. Planning the run is challenging: a lot happens before the marathon begins, success is dependent on pacing and nutrition during those hours. Mistakes severely impact performance so it’s important to fully appreciate how Ironman pace feels. Effort needs to be sustainable to the end of the marathon; any walking should be part of a plan, not something we’re forced into. It will be tough towards the end, but with a plan it is manageable. Assuming you finish the bike well fed and not excessively fatigued you are in a position to run a consistent race. Effort levels will feel easy, particularly early on; control is needed at this point and caps stop you overcooking. Working with pace often means capping hills slower than flats and descents, the work will be harder even though the speed is lower. Similar to the bike allow effort to rise a little on ascents, but avoid spikes in power. Tolerance for eating is typically reduced when running. You still aim for the highest intake manageable, but won’t match the bike. Keep feeding regularly so there is a continual stream of carbohydrate entering the system. Relate pacing to your ability to absorb nutrition – if you can’t stomach anything, slow down. Taper eating at the tail end of the race to allow yourself to push the remaining kilometres. If everything is on plan, you can go harder and won’t need any more food to reach the finish. Ideally establish threshold through a race, anything between a 10K and a half marathon can be used. Focus on the long run as the key Ironman session; most of the year this is steady (not easy) and edges close to race pace. During peak periods, prior to a taper, I incorporate sustained periods at and above Ironman pace. As on the bike this allows me to test my pacing strategy, appreciate how it feels and practice my nutrition. Have a plan. Know what you intend to do in advance. Monitor how you feel all day. What are energy levels like? Mood? Pace? Effort is always controlled and capped, know exactly what you are doing and why. Practice in training. Know how the effort feels when fatigued, know it’s sustainable. Eat as much as you can tolerate. Ensure you take in sufficient calories, avoid taking in too much. Practice in training. Know how much you can eat at pace, know what foods you digest well. If it works for you do it. Whatever you’ve read if something works for you when racing, go with it.